PHOTO CREDIT: JOE BROWN PHOTOS. 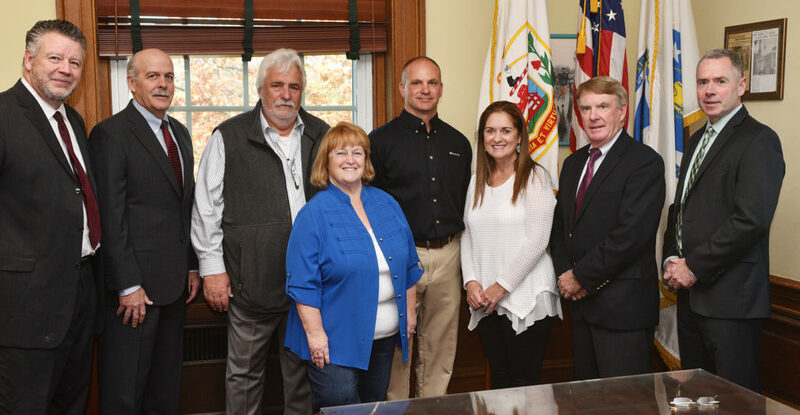 Pictured, left to right, is James McCorkle, CEO of Woburn Municipal Federal Credit Union; Glenn Johnson, Senior Lending Officer, NorthMark Bank; John and Kathy Flaherty; Brian Borselli, Associate Division Manager for Cummings Properties; Kathy Lucero, Vice President of Woburn Historical Society and 375th Anniversary Committee member; Don Queenin, Executive Vice President of Northern Bank; and Woburn Mayor Scott Galvin. 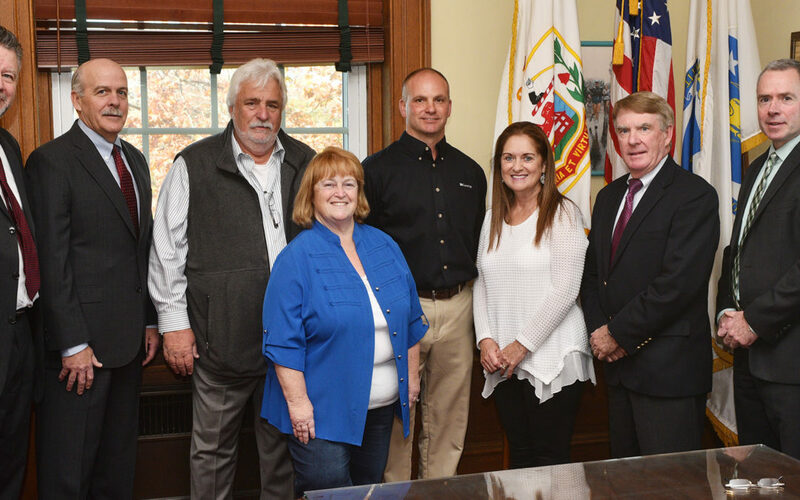 Several local banks and individuals have stepped forward with generous donations to help the City celebrate the 375th Anniversary of its incorporation in 1642. A committee has been working hard over the last several months to organize a variety of events throughout the year to commemorate this historic milestone. The magnanimous gesture in support of our community’s historical milestone ensures all of Woburn’s residents will have an opportunity to join the celebration of our great City, home to many and significant contributions to our nation’s history and progress dating back to the earliest Massachusetts Bay Colony history. This occasion represents an extraordinary opportunity to recognize the rich heritage of this great City and the significant contributions of the men and women who have gone before us. Our willingness to reflect and celebrate together are important steps in our own gestures to ensure Woburn remains a vital and caring community. January 2017: 375th Anniversary Kick-off Event: An Historic and Interfaith Celebration at the First Congregational Church, featuring a local children’s choir led by Lynn Burns, High School Choir, Mishawum Choral Society and a special 375th community choir, led by Brian Gilbertie. February 2017: Winter Family Festival and Hockey Classic at Woburn’s Leland Park, featuring sleigh rides, ice skating and fireworks. April 2017: Rededication of Historic Battle Road, the pathway of Woburn Patriots in the American Revolution. May 2017: Memorial Day Ceremonies, and a rededication at the historic First Burial Ground on Park Street. June 2017: Fishing Derby and Family Day at Horn Pond, and Historic Downtown Banner Celebration on Woburn Common, featuring the artwork of Woburn students. July 2017: Old Time Baseball Tournament at Library Field, as it was played in 1864. September 2017: 375th Anniversary Celebration Gala, with presentation of Official 375th Anniversary Souvenir Book at the Woburn Hilton Hotel. November 2017: Veteran’s Day Ceremonies on Woburn Common, honoring Woburn’s Doughboys on the Centennial of World War I. Stay tuned for more information about these events and more ways to participate and support the City’s 375th Anniversary!